Evil besieges Sanctuary once again. 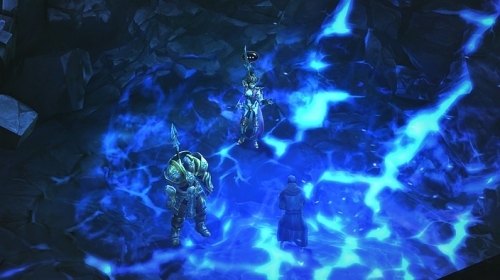 After 12 years, Blizzard’s Diablo III brings us back to Tristram to defend against the forces of evil. With the choice of five classes, this game supports several styles of play while massacring hordes of enemies. 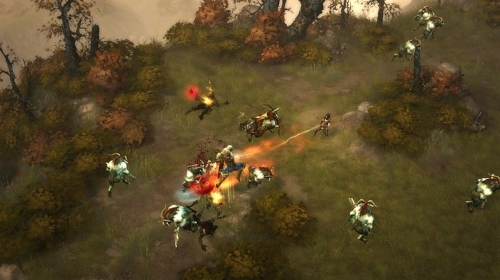 The game feels similar the previous iteration, but with several features tweaked and upgraded.For those new to the series, Diablo III is a roguelike in which the player hacks and slashes their way through randomly generated fields and dungeons while collecting treasure and completing quests. As the hero gains experience, he becomes stronger, learns new skills, and gains the ability to wear stronger equipment. When a meteor falls from the sky and strikes New Tristram, the evils that have been dormant for twenty years are awakened. The hero to drawn to the village, and accepts tasks assigned by the townsfolk. Among these is the mission of finding Deckard Cain, who fell into the depths of the cathedral when the meteor made its impact. The class system has been simplified, and stat points are now distributed automatically between Strength, Intelligence, Dexterity, and Vitality. The Barbarian is a strength-based class, Witch Doctors and Wizards use magic, while Demon Hunters and Monks use their dexterity to best their foes. Vitality is important to each class, as it determines the character’s life total. As the player reaches new levels, new skills and skill runes are unlocked. A player can switch between skills at any time, and choose which rune to use, if any, to provide a boost to the skill. This system allows the player to use every skill, instead of locking into one decision like in previous games. Character level is capped at 60, and most of the customization occurs in the form of equipment. There are equipment slots for the player’s main hand, off hand, helm, gloves, bracers, torso, belt, legs, and boots, as well as two rings and one amulet. When a monster is killed or a breakable object is destroyed, equipment and other items may be dropped. The level of the gear is determined by the location and difficulty in the current game. Within this constraint, items may be of common, magic, rare, set, or legendary quality.The quality of the item determines many of its characteristics. Common items are basic, and generally provide a small boost to armor or attack damage, while having few other special properties. Other items will have special affixes which determine the special properties granted by wearing them. There are many affixes, including sockets which can be filled with jewels, allowing an additional level of customization. With this amount of randomness, high level players may find themselves spending many hours running through dungeons searching for optimal gear. Some may enjoy this hunt to specialize their character, and those who don’t may become frustrated. Thankfully, the Auction House provides a way to find items without having to hope that they are randomly generated. On top of these quality levels and special properties, there are still more ways to customize equipment to tailor it to specific wants or needs. There are four varieties of gems that can be placed into socketed items, and there are 14 levels of gem quality. The first eight levels can be dropped in the same way as equipment; all others must be created by bringing lower level gems to the jewelcrafter. Optimizing gems will also take quite a bit of time. Crafting the next level of gem requires three of the current level, in addition to some amount of gold and a number of jewelcrafting pages or tomes. Due to this exponentiation, Creating a Radiant Star gem (the highest quality) requires at least 729 Flawless Squares, or up to 1,594,323 Chipped gems. The bonuses granted are increased slightly with each increase in quality, but at higher difficulties, even the slightest advantage can prove to be very beneficial. Blizzard has announced that the jewelcrafting ratios will be changed from 3:1 to 2:1 up to the eighth gem level in a future patch. Additionally, there are also dyes which can be applied to armor, changing the color without affecting the stats or abilities it grants. Dyes come in over 20 colors, including Vanishing Dye, which when applied to a piece of armor, grants invisibility to that piece. With this many items and levels of quality, the Auction House proves to be a key aspect of character customization. Equipment, gems, dyes, and crafting supplies can be purchased from other players through the Auction House, with 15% of the cost being taken from the economy. Unfortunately, many players are using the buyout feature instead of bidding on auctions themselves. Players tend to be searching for items they will need immediately, instead of those that they may need in two days. Since the Real Money Auction House has been delayed, we have yet to see how it will influence the economy, or whether it will lead to the downfall of online games as we know them, as some have predicted. Several other features have been adjusted. Creating town portals and identifying items no longer requires scrolls, but instead these tasks take several seconds to complete. Health potions now have a cooldown, and mana potions have been removed altogether. Monsters may now drop health orbs, which function similarly to potions, except that they are applied automatically when they are picked up. 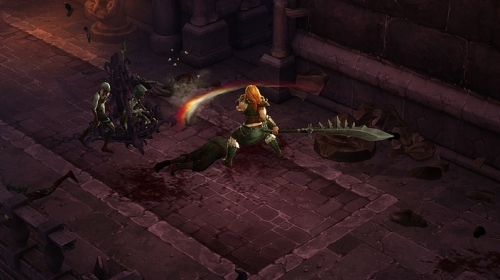 These changes change the flow of combat greatly from Diablo II. Players can no longer change into battles without being the proper level, spamming potions, and using portals to quickly escape from a tight spot. 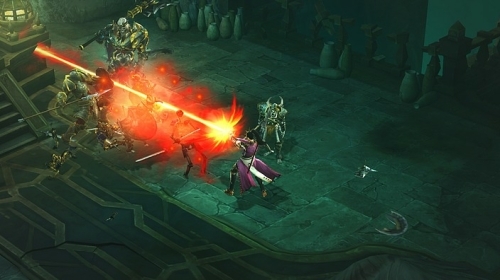 Given the level of attention Blizzard paid to gameplay mechanics, the plot of Diablo III seems almost like an afterthought. It is by no means bad, and there are epic moments in the game, but some of the character development and plot points may leave the player annoyed. In one instance, there is an entire quest in which the hero helps to retrieve some important artifacts for an NPC, all the while saying “You better not betray us once you have these.” It is far from surprising, or climactic, when the hero is forced to battle the traitor. There are also several demons, supposed embodiments of certain traits, who appear to lack the traits entirely. Perhaps the plot is not meant to be a strong aspect of this game, but it would be nice if it were more engaging since the game is meant to be played through many times. 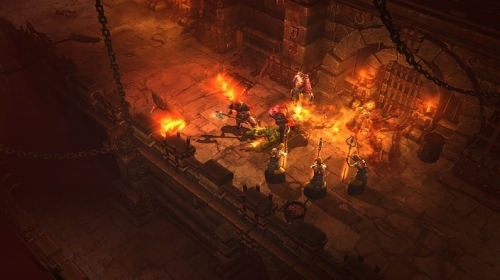 Large maps, five playable classes, and near endless loot possibilities, Diablo III is as entertaining as it is replayable. Russell Brower's score is superb. Additionally, fans of the franchise may hear a few familiar sound effects. There has been much controversy over the stylistic changes to the color palettes, but the game remains just as gruesome, and more beautiful than ever before. The controls feel similar to past Diablo games, with some changes, perhaps ones that have been tested and approved in World of Warcraft. There is an option to ensure attempted attacks are not confused with moving, but no option for the opposite. 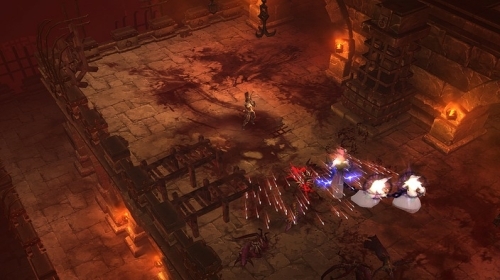 While Diablo III may not revolutionize the roguelike genre, it still improves upon the previous two games. Forgive the occasionally wonky always-on DRM, and prepare to be entertained for hours.